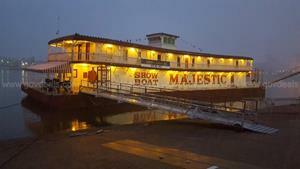 The Showboat Majestic was originally built in 1923. The 221-seat theater is known to be the last floating theater in America, and the only one of its kind still intact. The showboat was declared a historic landmark in December 1989. The Majestic was originally purchased by Tom Reynolds. The Reynolds family owned, lived on, and operated the boat for many years, offering travelling entertainment to residents of the towns along the Ohio River. To this day, the Majestic remains the longest-lived floating theater under one owner. The Majestic was also used by students from schools like Kent State University and Indiana University to present shows to their student bodies during the summer months. Reynolds eventually sold the boat to Indiana University for a reported $30,000 in 1959.The boat is now being offered for sale with a starting bid of $10,000. The show boat was purchased by The City of Cincinnati in 1967 and was leased to the University of Cincinnati which operated it until 1988. It was leased to Downie Productions in 1989, and then leased to Cincinnati Landmark Productions (CLP) which operated the theater and performed maintenance and nautical duties until 2013 when they terminated the lease. In 2007, the city agreed to enter into a preservation covenant with the State Historic Preservation Office and the National Park Service in return for a restoration grant from the State. The covenant requires that the boat be maintained and that its historic character be kept intact. The purchaser of the showboat will be required to enter into and abide by a new covenant with the same restrictions, with the State Historic Preservation Office in order to purchase the boat. The Majestic, now moored at the City of Cincinnati’s Public Landing, is required to be accessible by the public for no less than 12 days per year. The new owner must publish the dates and times the boat is open annually and provide this information to the State Historic Preservation Office. The complete terms and conditions of the covenant can be viewed on the auction page. Neptune Marine Surveys & Services, Inc. conducted an inspection of the Showboat Majestic in February 2018. The full report is also attached to the auction page for public viewing. The showboat can be inspected before the auction end date of February 9th at the Cincinnati Public Landing on the Ohio River at 435 E. Mehring. For prospective buyers who want to inspect the boat, arrangements can be made with Andy Schuermann at 513-475-9600. Buyers interested in purchasing the showboat will need to register as a bidder with GovDeals. Registration is easy and free and can be completed at govdeals.com/Register. GovDeals is a marketplace of Liquidity Services. Liquidity Services (NASDAQ: LQDT) is a global solution provider in the reverse supply chain with the world’s largest marketplace for business surplus. We partner with global Fortune 1000 corporations, middle market companies, and government agencies to intelligently transform surplus assets and inventory from a burden into a liquid opportunity that fuels the achievement of strategic goals. Our superior service, unmatched scale, and ability to deliver results enable us to forge trusted, long-term relationships with over 10,000 clients worldwide. With over $7 billion in completed transactions, and 3 million buyers in almost 200 countries and territories, we are the proven leader in delivering smart surplus solutions. Let us build a better future for your surplus. Visit us at LiquidityServices.com.